When you write data to an LVM logical volume, the file system lays the data out across the underlying physical volumes. You can control the way the data is written to the physical volumes by creating a striped logical volume. For large sequential reads and writes, this can improve the efficiency of the data I/O. Striping enhances performance by writing data to a predetermined number of physical volumes in round-robin fashion. With striping, I/O can be done in parallel. In some situations, this can result in near-linear performance gain for each additional physical volume in the stripe. In a striped logical volume, the size of the stripe cannot exceed the size of an extent. Striped logical volumes can be extended by concatenating another set of devices onto the end of the first set. In order to extend a striped logical volume, however, there must be enough free space on the underlying physical volumes that make up the volume group to support the stripe. For example, if you have a two-way stripe that uses up an entire volume group, adding a single physical volume to the volume group will not enable you to extend the stripe. 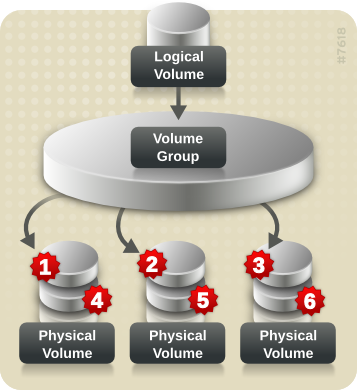 Instead, you must add at least two physical volumes to the volume group. For more information on extending a striped volume, see Section 5.4.14.1, “Extending a Striped Volume”.